Noah brings the animals into the ark. HE CHILDREN OF Adam and Eve lived to be very old. Their children also lived for several hundreds of years. And so it was that grandsons became grandfathers before their own grandfathers died. Thus several generations lived and worked together. After a while there were many people living in the world. We do not know very much about those people of long ago except the fact that many of them were very wicked. Among them was one man, however, who, like Abel, tried to please God. This man's name was Enoch. The Bible tells us that Enoch walked with God. We understand that he loved God better than he loved anything else, and talked to God and listened when God talked to him. Finally Enoch became an old man. At last, when he was three hundred and sixty-five years old, one day God took him away from earth to heaven, and he did not die. Enoch had a son whom he named Methuselah. This man lived for nine hundred and sixty-nine years, until he was older than any other man had ever been. Then he died, like all other people had done except his father Enoch. By this time there were many, many people living in the world. And their hearts were so full of sin that their thoughts and words and deeds were all very wicked. They did not try to please God at all. They did not love him. They did not thank him for the blessings of food and shelter and sunshine which he gave to them. They did not teach their children to love good, pure things, but allowed them to grow up and become evil men and women like themselves. What a sad world this was! for sin was everywhere. Finally God planned to destroy all the people because they were no longer fit to live. He felt sorry that he ever had made man. He thought he would destroy everything-people, animals, and every other creature that lived on the earth. He would cause a great flood of water to cover the earth. Then God remembered Noah. Here was a man who had tried to do right regardless of all his wicked surroundings. And he had taught his sons to do right also. God was pleased with Noah and with his sons. Sometimes he talked to Noah. Now he told him about his plan to destroy the world. But because Noah and his family had been trying to do right and trust in the Lord, God promised that they should not be destroyed with the wicked people. "Get ready to build an ark," God told Noah, "and then when it is finished you and your wife, your sons and their wives may go into this ark and live there until the flood is ended." Now that God decided to save a few people he also arranged to save a pair of each kind of animal and of bird and of every living thing on the earth that breathed. 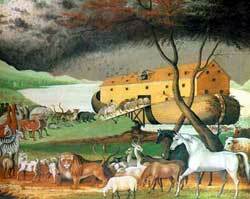 These creatures were to be housed in the ark, too, while the flood should last. Noah believed God and made ready to build the ark. God had told him how it should be built. For a long time, while others went their wicked way, he and his sons worked, sawing boards and hammering nails, and making every part of the ark just exactly as God had said it should be made. Then by and by every nail was driven securely into its place, the inside walls were finished, and every part was ready for the purpose it should serve. What a queer-looking building now stood before them-a very large boat-like house three stories high, away out on dry land! Doubtless the people laughed much at faithful old Noah and his three sons. Perhaps they thought that only feeble-minded folk could believe that there ever would be such a thing as a flood. Still Noah continued to warn them that they should repent of their sins lest God destroy them. One day, when the ark was completed and everything else was in readiness, God called Noah and told him to bring his wife, his three sons and their wives, and come into the ark. And the animals and birds and creeping things God caused to come also, two and two of every kind; and of those animals which man should need after the flood, and birds, seven pairs of each kind came. When they were all inside the ark God himself shut the door. After a few days the rain began to fall. And such a rain! Great sheets of water poured down from the clouds as if windows in the sky had been opened and water was flowing through them. Soon the tiny streamlets were raging torrents and the rivers were overflowing their banks. People began to forsake their homes and rush to the hills for safety. Animals, too, ran pell-mell everywhere, trying to find a place of refuge and shelter from the storm. But still it rained, and higher and higher the waters rose until every one believed at last that Noah had told the truth. But now it was too late to repent and seek refuge in the ark, for God had shut the door. And so when the waters crept up to the tops of the hills and mountains and finally buried them out of sight, every living creature on the face of the earth was drowned. Those in the ark were the only ones left alive. For forty days and nights the downpour of rain continued; but Noah and his family were safe. When the waters rose high enough they lifted the ark off the ground, and it began to float about like a great ship on the top of the flood. For six months and more it floated high above the water-covered earth. Then one day it came to a standstill. God had caused a wind to blow over the waters to dry them up, and as the flood-tide became gradually lower, the ark had found a lodging-place on the top of a mountain. Here it rested for two months, and all the while the water-mark continued to drop lower down the mountainsides. After waiting for some time, Noah opened a window, which must have been very high up, near the roof. He allowed a bird called a raven to fly out of the window. Now, the raven has strong wings, and this bird flew to and fro until the waters had gone down. After some days, Noah sent out a dove; but this bird could not find a place to build her nest, so she soon returned again to the ark. Another week of waiting passed, and Noah sent the dove out once more. She stayed longer this time; and when evening came she flew back to Noah, bringing a green olive-leaf in her mouth. At this Noah and his family knew that the waters were returning to the rivers and the seas, and that the land again was becoming green and beautiful. One more week they waited, and now when Noah sent out the dove she flew away and never returned. Now Noah believed that the time had come when he might uncover the roof and look out upon the earth. How glad he must have been to see dry land again; for more than a year had passed since God had shut them inside the ark. And God said to him, "Come out of the ark, with your wife and your sons and their wives, and every living thing that is with you in the ark." So Noah opened the great door, and he and his family stepped out upon the dry ground. All the animals and the birds and the creeping things came out also, and began to live upon the earth as they had done before the flood. Noah was thankful to God because his life and the lives of his family had been saved when all other people had perished from off the earth. He built an altar as soon as he came out of the ark, and brought his offering to God. Because Noah had been obedient, God accepted his offering and was pleased with his household. God then promised that never again would he send another flood to destroy every living creature, and that as long as the earth should remain there would be summer and winter, springtime and autumn, and day and night. And because God wanted mankind to remember always the promise that he would never again destroy the earth with a flood, he placed in the sky a sign of his promise. That sign was a beautiful rainbow. Have you ever seen that rainbow-sign? It is God's promise to all mankind-to you and to me as well as to Noah and his children.